Arturo Alvarez is an alternative and dynamic company, with its own personality. They design and manufacture all types of decorative luminaries, for home and commercial premises. Concerned with innovation in design, materials and energy saving light sources, their designs can be customized, allowing you to choose from different finishes and colors depending on what is needed for each decor. The team at Arturo Alvarez Emotional Light strive to create exceptional residential and commercial lights: “We put all our hopes and resources to provide with hand-made designs, meticulous in every detail and able to fulfill all the lighting and emotional needs of any human being. Different international prizes certify our work, over the years, as being an honest and innovative company.” Enjoy the Q & A showing how he became a successful lighting designer, maybe you can follow the advice that will guide you in the right direction. Freshome: What was the first time you thought about producing decorative lights? Arturo Alvarez: One day, by chance I had a sheet of frosted glass in my hands, in that moment I started to think about how to make a lamp with this material. Freshome: What were the main obstacles you had to overcome in your first years as a light designer? Arturo Alvarez: The geographical distance with respect to the raw material supply centers related with lighting. We are in the northwest, in Galicia and the lighting industry in Spain is in the East, in Barcelona and Valencia. Freshome: What do you consider the most important traits a light designer should have in order to succeed in this business? Arturo Alvarez:The first thing every designer must have is an open mind, always keeping some degree of freedom to be able to offer something different to the market. Then it´s hard work until the design concept comes to fruition, along with the necessary brightness and a certain depth of intuition to connect users with their needs – which are ever changing. Freshome: How did you feel winning your first prize for lighting systems? Arturo Alvarez: It gave me energy, more confidence and was the first awareness that the work I do is considered honest and valid. Freshome: What was the most important thing that led to the creation of LAB Arturo Alvarez, the “laboratory of ideas” that brings together your design team? Arturo Alvarez: Keep the company fresh, not to close the design under the same vision. Bring new ideas. Enrich ourselves by all working together. Freshome: How does one become an expert in combining function and feeling in a lighting system? Arturo Alvarez: Work, work, work, the experience gained from the years, from life, to be sensitive towards everything around us and never lose the sense of curiosity and surprise. Freshome: How do you start the process for a new light? Please tell us about the inspiration and creative process behind your beautiful creations. Freshome: Do you use concepts or materials as starting points for your designs? Arturo Alvarez: Yes, sometimes yes, I don´t only have a single way to tackle the designs. The mixture of mesh with silicone, a material which took two years to develop, sometimes the material itself gives me ideas as it already has multiple possibilities of textures, volumes and sizes. Freshome: Did you ever have an idea that couldn’t be turned into a light because the technology or material did not exist yet? Arturo Alvarez: Yes, the home automation system is advancing, to switch on a lamp from a computer, from any point at home or in the car, to alter its intensity, in the future this will be perfect. LED technology must also advance further, more refined, so that it does not technically fail and provides a good flow of light. Freshome: What differentiates a light for home from a light for commercial spaces? Arturo Alvarez: The idea is the same: to complement the decor in a harmonious way achieving a specific light effect. Before in commercial lighting, functionality was a priority. Since few years ago concepts such as well-being, comfort and enjoying oneself with pretty and original forms, which also provide pleasant light, is the most common and requested. Freshome: How do you jump-start your inspiration when the muse fails to show up? Arturo Alvarez: I never go blank, I always have ideas. If I happen to get stuck one time with an idea, for whatever reason, then I leave it for a while and then return to it or drop it altogether. Freshome: What was the worst mistake you made since you became a light designer? Arturo Alvarez: I have made a lot mistakes, many kinds, but I always use them to learn, rectify and improve. Above all I look for honesty and excellence in what I offer. Freshome: Tell us about the most important events leading to your present career – like school, practice, team work. Arturo Alvarez: The most important thing is to keep innovating, searching for new alternatives, to surprise and not bore the public. Freshome: How do you see the evolution of lighting systems – from the light bulb to modern lights? Arturo Alvarez: Incandescent light is very warm and human beings still feel very attached to it because for many years it has formed part of our history. The fact is that we must inevitably move towards energy saving sources, and think that all of us must contribute in not continuing to squander the planet’s resources. Freshome: How do you see the future of lighting systems? Arturo Alvarez: I see them controlled by computer, making a rational use of them and all with sources of low-energy consumption. Freshome: Please explain how your tagline “emotional light” helps develop your products – do you base your designs on how people would feel in relation to them? Arturo Alvarez: I will answer you with a wonderful story I was told today. One of our co-workers has a small son and in his house he has the standing Gea model, which resembles a female body. Well, this co-worker told me that his son likes to hug the lamp. 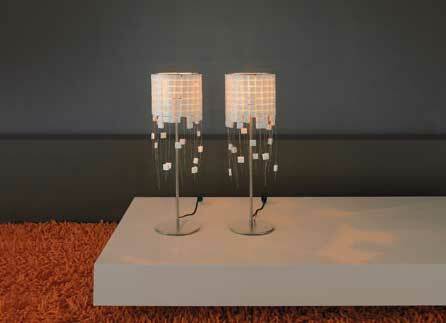 It’s the nicest thing I´ve ever heard about what one of our lamps can arouse in people.